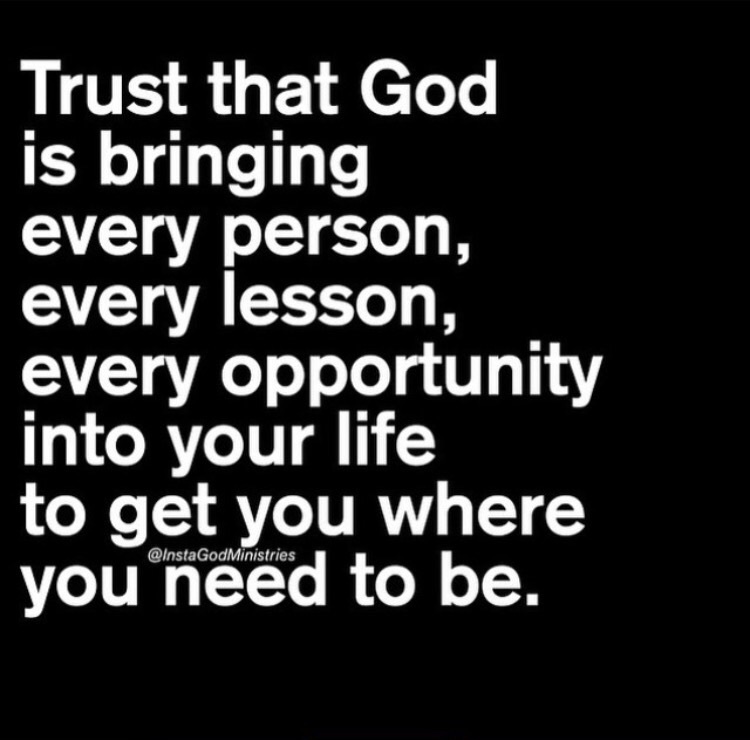 Always trust in the Lord! The unfairness of life is commonly held knowledge in this fallen and broken world. Paradoxically, bad things happen to good people and good things happen to bad people. The beauty of surrendering your life to Christ is not that suddenly bad things no longer afflict you, but rather that God wastes nothing with these bad things. Even during our darkest and seemingly hopeless times we are able to trust in God’s perfect timing that our sufferings and afflictions(all things) will be redeemed working for our good (Romans 8:28). One excellent example of this is how God redeemed the most heinous form of evil, the crucifixion of His Son Jesus Christ, into our means of salvation and where He is able to be eternally glorified. Personally, I take deep comfort in knowing that God is completely sovereign and that anything that I face in my life has passed through His mighty hands first. Collisions 1:16-17 tells us, “For in Him all things were created: things in heaven and on earth, visible and invisible, whether thrones or powers or rulers or authorities: all things have been created through Him and for Him. He is before all things, and in Him all things hold together.” Not only is God the creator of the universe, but He is its All-Sovereign Ruler! He exercises control over even the most minute details of our lives (Dr. Robert Jeffress). Even when we are most vulnerable God is still in control. Amazingly, it is through these very vulnerabilities that help us to become more dependent upon God. In addition, this form of refiner’s fire will actually shape us into stronger people where we can become more useful for the furtherance of God’s Kingdom. We become more useful primarily through being able to authentically empathize with others who are going through the same struggles that we ourselves experienced! Ecclesiastes 3:16 effectively portrays the reality of an unfair world through essentially saying that there is wickedness where justice should be. It is certainly no secret that even people of authority will sometimes misuse their positions of power for self-gain and self-advancement rather than helping others as they should. This is seen in different legal systems, workplaces, and even in some churches. Verse 17 of the same passage transitions into reminding us that in the end God will have the final authoritative word through His perfect judgement! As Christians we need to realize that this will happen in His timing and not ours. We are the clay and He is the Potter where we are simply the work of His mighty hand (Isaiah 64:8). Although some things will definitely not make sense right now, particularly with life’s seemingly endless stream of injustices, we must still trust in our Heavenly Father’s perfect timing with everything. Any material advancement with wickedness will be extremely short-lived in the much larger context when we compare this fleeting earthly life to an eternity. Therefore, it is integral that we focus on the bigger picture by keeping our eyes fixated on Christ especially during the times that it seems our lives are falling apart while the world appears to be prospering. As Christians we also need to take comfort and confidence in knowing that the best is truly yet to come. The time we spend on earth is minuscule compared to the eternity that we will spend with Jesus by standing firm to the end (Matthew 24:13) through being preserved by God(1 Peter 1:4-5). We are like foreigners (1 Peter 2:11) merely passing through from this age onto the next. Our true citizenship exists in Heaven with our Saviour (Philippians 3:20). Ultimately, Jesus is the Answer to all of the unfairness in life. Our Loving God doesn’t simply provide for us an explanation but instead He goes much, much further through giving us Himself through His Incarnation. I pray that this blog entry is able to bring comfort and security to us in knowing that You are Sovereign over everything even when things do not make sense. Please help us to constantly remember that the best is truly yet to come as we surrender our lives to You and completely trust in You through active obedience to Your Word. Note: Some exegetical thoughts in the paragraph on Ecclesiastes, and some other minor areas(thought of contrasting life’s shortness to eternity; last paraphrased statement immediately before prayer) were taken from my pastor’s sermon of which I cannot take credit for. elaborating on a number of the subjects you write with regards to here. Thank-you so much, all glory to God though! I can be reached at Conqueror116@gmail.com to discuss this prospect further.